A child’s speech development is not just about his/her articulation skills (as I discussed in my last post). When SLPs are assessing a child’s speech we are also looking at the sound patterns that the child is (or is not) producing correctly. These patterns are called phonological processes and today I am going to tell you all about them! Phonology is the study of how speech sounds (i.e. phonemes) are organized and used in a language. This includes the study of the individual sounds of a language (phonemes), their patterns, how they are learned (phonological development) and how they work and go together. You see, all the sounds in English are organized and classified into different classes based on the sound’s place (where in the oral cavity they are produced), voice (if the sound requires voice, like b,d,g vs an unvoiced sound as in p,t,k) and manner (the “manner” in which the articulators alter the vocal tract and the degree or type of closure of the vocal tract when producing a sound). Though these classes of sounds may not seem very interesting to the average person, this information can become very important when trying to assess and treat a child with very unintelligible speech. Simple answer: They are the typical patterns of how a child simplifies his speech (so “normal” speech sound errors) as they learn to speak. A child is not born being able to produce all the sounds and sound patterns of his/her language. As a child is learning how to speak English, he will simplify sounds and sound patterns. For example, a young child will simplify the word “bottle” to something like “baba.” A young child may also say “goggie” for “doggie,” “sue” for “shoe,” or “nail” for “snail.” Phonological processes, then, are the normal patterns of simplification all children use as they are learning to speak. Just like articulation skills, every child will develop their phonology skills differently, but there are ages when a child should stop using different phonological processes. Here is a chart defining the different phonological processes and the age in which they should no longer be used. 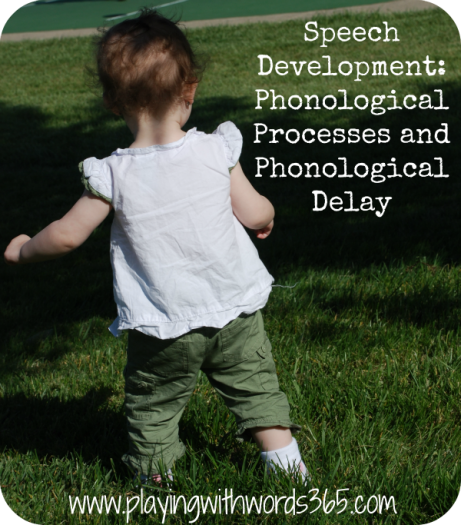 What is a Phonological Delay? A phonological delay refers to when a child is continuing to simplify his speech (using these phonological processes) beyond the typical ages of use (see my Common Phonological Processes Chart). A child with a severe phonological delay may even be simplifying his speech so much that he is only producing a few different sounds when he should be able to produce many sounds (this is when those “classes” of sounds can come in handy). Children with phonological delays tend to be quite hard to understand, especially to strangers (parents often learn their child’s patterns and therefore can understand them better). What is the cause of a Phonological Delay? 1. The child finds the sound patterns of language totally confusing and cannot make out sound details form the overall pattern of sounds in language. system, and knowing how to organize their sound system in a consistent way. How can I tell if my child has a phonological delay? Your child deleting the initial sounds in many of his words (called Initial Consonant Deletion). For example, “ig” for pig or “ed” for Bed. Your child is substituting “back sounds” (like k, g, h, ng) for sounds that are produced at the front of the mouth (like t, d, p, b, m, etc). For example, “kop” for top. If you haven’t already, make sure to read my post all about articulation development to get the “whole” picture of your child’s speech development. Bowen, Caroline, (1998). Typical speech development: A gradual acquisition of the speech sound system. Retrieved from http://speech-language-therapy.com/acquisition.html. Williams, A. Lynn, (2003). Speech disorders resource guide for preschool children. Clifton Park, NY: Singular Publishing Group. I love your phonological processes chart! It would be great if you could provide a link to it as a PDF so we could print just the chart. Thanks! Thanks for the information! I am a SLP in a school setting and recently screened a pre-k student (he turns 5 in a month) who presents mainly with cluster reduction. I was told by another SLP that this is something that does not need to be worked on a this time. I don’t agree with this comment. Any thoughts? Donna did you happen to give the HAPP? I’d have to see the profile of the child to know for sure. For example, if he is suppressing the majority of clusters, then YES. How is intelligibility? Any other processes seen? At almost 5 we should be able to understand nearly all of his speech regardless of age appropriate errors (like /r/, “th” etc). It really depends on the whole picture but if he is still suppressing most of his clusters I’d guess his intelligibility is quite poor? Sorry it has taken me so long to get back to you! This student only presents with cluster reduction on /s/ blends. He also inconsistently substitutes /s/ for /sh/ and /ch/. The teacher has told me that he is difficult to understand at times and that’s why he was referred for a screening. I have not yet done a full evaluation on him, just a simple screening. I have read a few of your posts now and am very happy to have found them. I can see from the chart that what my three year old does is called gliding when she replaces the l with a y sound. I can’t quite understand the chart’s age of elimination as it says 5-0. She is very easy to understand otherwise but I have been wondering if I should have her speech evaluated or if she is still in the normal range for this process. Would you be willing to share your phonological processes chart with me? I’ve got several preschoolers’ parents that could benefit from it. Thank you so much for this article! It is very well-written and useful. Do you have any suggestions for children’s books that help with phonological processing? A parent is looking for ways to help her child at home. Hi Joan, you used the term “processing” so I want to clarify…to work on phonological processes or phonological awareness? Regarding phonological processes, I will sometimes recommend books that contain a lot of the process we are working on at the time, but I do not have a list of these yet. HI Katie, my daughter is 4-4 and was late talker (2 word sentences at 2-9) and still presents, I guess, phonological delay. Just want to ask if the consonant reduction of /s/ words will eventually disappear? She seems to really struggle to say it together 🙁 she does speak the same at certain times as her younger brother 2-4. Thank you so much, Katie! A co-worker asked me for this information today and I am printing your chart as I type this to give to her and my families for parent education. YOU ROCK!! it was recommended she see a speech pathologist, she is 3, however based on charts it appears that this is normal “fronting” and will usually go away, but later in the post under phonologic delay fronting is a reason to seek treatment- should we wait or have her further evaluated? Sima, it really depends on your child’s entire sound system. I’d recommend having her seen by an SLP just to check. You can get a screening through your local school district (free) just give them a call and ask for a speech screening. My 3.5 year old son can’t make a D or a B sound. When he tries to repeat me after I say, dee dee dee or bee bee he replies eee. Blue becomes mlue and black becomes whack. Baby is aaa eee daddy is ahee. He starts speech therapy in December, he is very hard to understand. For whatever reason the b and d thing conserns me the most. I have googled and googled and can’t find one other person with this specific problem. I have never heard of anything like it and it stresses me out. Any ideas? Hi Michelle. I can’t say for sure what is going on but at this age the most likely causes are a phonological delay or childhood apraxia of speech. Glad to hear he is starting therapy! Loves your site! My 4 yrs 3 mths girl is still not pronouncing sounds as she should. She pronounces “p” for “f”, “k” for “ch”, “g” for “j”, not able to pronounce “s” etc…Is this developmental delay & is there any method that can help me to rectify her speech to be more understandable to others?? Hi Christina, welcome! It’s hard to say without actually hearing her myself…if you find her speech isn’t at least 80% understandable to strangers, I recommend having her seen by a speech pathologist. If you are in the US, you can get an assessment through your local school district. Good luck! Thank you for this info! I’ve been a little in denial that my 3 year old may need some articulation and phonological help. Maybe because my oldest was a phenomenal speaker I didn’t want to judge my second daughter based on her but this info makes it clear she needs some help. She rarely says the ends of one syllable words but is able to say multisyllabic words which confuses me. She talks in full sentences though so I’m hoping she won’t need very intensive work on it. When I gently ask her to repeat a word she “should” be able to say, she tries and then says, “But I’m still little”. She scored 51 errors on an articulation screener when she should have scored less than 30. I’m a former teacher–do you think I could work with her at home first to try to remedy the issues? Are there any good resources available? Hi Freda, I highly recommend having your child assessed to have an SLP take a good look at what is going on as there are different ways to treat delays and only an SLP will know which treatment method will be most appropriate. Good luck! This post was wonderful being a new SLP it really put phonological processes in a very simple way that I can use to explain to parents, thank you so much! Thank you for this. My almost 5 year old was assessed about 2 years ago and it was determined he had major issues. All that was mentioned was articulation, though. They were trying to get him to work on speech sounds starting with /f/ and /s/. Phonological delay was never mentioned, even though it’s clear from this article that his main problems are with phonology. He drops the ends of words constantly, he has trouble with some vowel sounds (eg instead of wipe he says wup). We frequently don’t understand what he’s saying and it’s even worse for people who don’t know him. He’s a really smart kid, but also really stubborn. All attempts to get him to improve are rebuffed, he insists he’s saying things properly. I’m kind of tambling. Sorry. It’s just such a relief to find something like this. The implication I got from the speech therapist was that he had some never before seen speech issues. To see his issues are known is huge. Now I can maybe figure out how to help him, since it’s clear I’m not getting actual help for him from the speech therapist we saw.